The Bobike Tour is an innovative rear-mounted bicycle safety seat for children. It provides optimum comfort for children from 9 months to 6 years of age, up to 22 kg, 48 lb. It is safe for the child and user-friendly for the parent. The Bobike Tour will always adjust to the right size for your child because of the patented safety belt system and foot rests that adjust in length. The Bobike Tour also offers extra protection, even for a sleeping child, with a head support that easily adjusts to your child’s height. 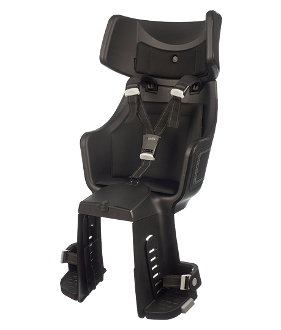 The unique safety belt system gently restrains your child’s shoulders and is easy to adjust to size. Standard equipment for the Bobike Tour includes an integrated LED light and spoke protector. Also approved according to EU safety standard EN14344. Mounts to existing luggage rack or one point mounting bracket (sold seperatley).